But the EU is also finding other sources of energy. Last year Lithuania began importing liquefied natural gas (LNG) from Norway, a development that has diminished Gazprom’s grip over the small Baltic country. Lithuania has even been willing to pay a 10 percent premium for Norwegian gas – a rate that Lithuanian officials noted was still less than what they paid for Russian gas in the past. “From now until forever, our access to LNG puts a cap on what Gazprom can charge us,” Lithuania’s energy minister Rokas Masiulis said in a Reuters interview in November 2014. Moreover, Ukraine slashed imports of Russian gas by 44 percent in 2014 to its lowest level in 15 years. Much of that has to do with the conflict between the two countries, including Russia forcing a sharply higher price for gas than Ukraine had received under former President Viktor Yanukovych. And that figure may be less impressive than it seems at first blush – Ukraine is receiving natural gas in reverse flows from its western neighbors, gas that may have originally been imported from Russia. There are other gloomy problems for Gazprom over the long-term as well. Croatia and Poland are both planning on bringing LNG import terminals into operation in the coming years, allowing them to tap into the wider global market for gas. Not only that, but the two countries hope to construct a north-south pipeline to link up their LNG terminals, providing greater flexibility for the region. Also, Russia was forced to back away from South Stream in late 2014 after the EU sought to block the project because it ran afoul of antitrust rules. The EU is still preparing an antitrust case against Gazprom. The South Stream pipeline, if constructed, would have delivered gas beneath the Black Sea to Bulgaria and then on to the rest of Western Europe. 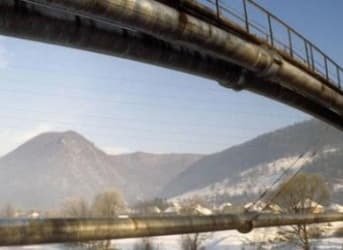 In an effort to bypass both Ukraine and tricky EU antitrust laws, Russia has now proposed building a pipeline to Turkey, which is not a member of the 28-member bloc. The pipeline would connect Russia to the only European country with significant opportunity for growing demand. Gazprom’s CEO Alexei Miller went even further – he recently suggested that Gazprom may even cease delivering gas to Europe through Ukraine entirely over the next several years. Instead, Gazprom would send its gas to Turkey, and the EU would need to import it from there if it decides it still needs Russian imports. The comment comes off as a subtle threat, but beneath the bluster is the reality that Gazprom is being beaten back by a combination of factors, weakening its position in Europe. The West will have to find a way to place a stooge/puppet in the Kremlin, or it won't be too pretty for Russia-haters. Hence all the hysteria about Putin/Russian aggression and all the propaganda articles such as the above. Compared with the second decade of February, Ukraine in a half times increased natural gas imports from Russia. According to "Ukrtransgaz" from 10 to 19 February with Russia, Ukraine imported about 30 million cubic meters of gas per day, while February 20 - there are 46.58 million cubic meters. Is another part of the equation the aggressive growth in renewables in Western Europe? There is a lot of wind and solar now feeding the grid reducing the need to burn gas for electricity. Renewables account for a very tiny percentage of the energy mix. Even worse is that after the Japanese Fukushima Nuclear disaster, Germany has been phasing out nuclear power. Ironically, Germany has turned to highly polluting lignite coal, which is abundant and cheap, to plug the gap. LNG replacing Russian gas is a pipedream, it's too expensive, as this article points out.